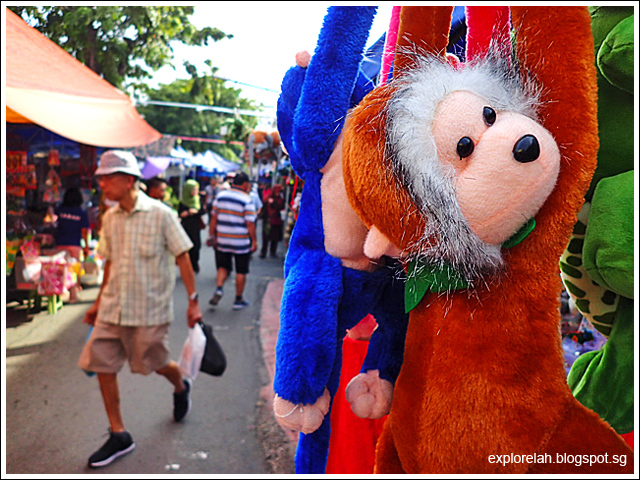 Bustling street markets are always so full of surprises and a chance at speed-reading the local way of life. I'm talking about authentic, unadulterated markets that have sprung up from the people's needs and not something assembled for tourists. Sold as pets, not as meat. 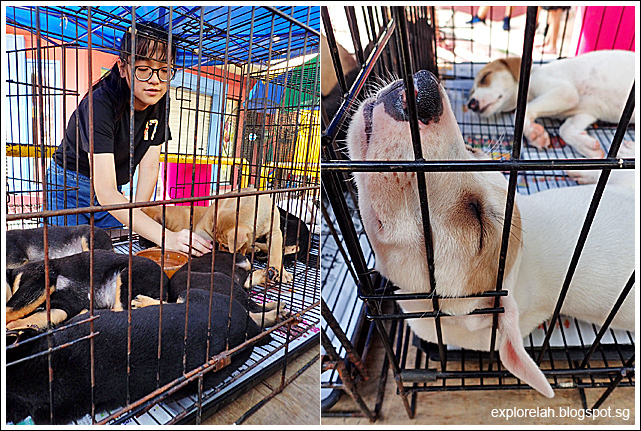 There's quite a thriving pet trade at the street market. 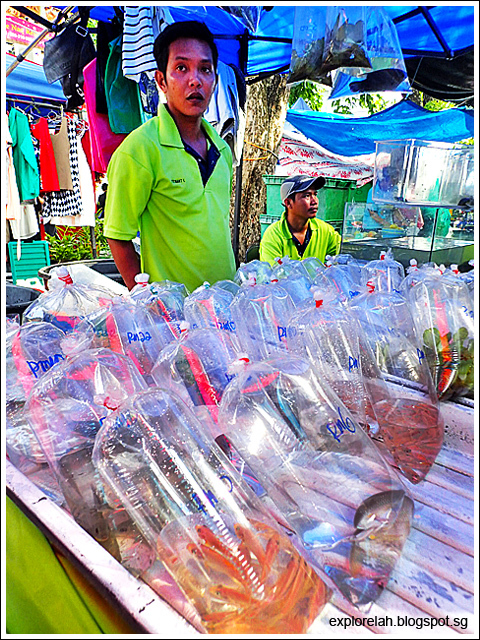 I think it is refreshing that a street market is so big on pets. 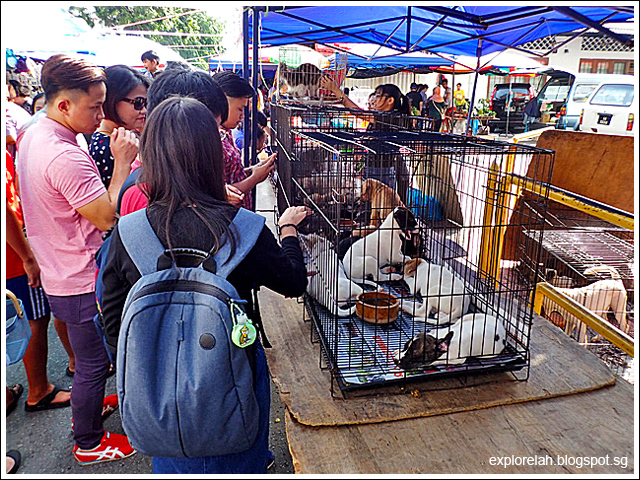 Especially in Malaysia where dogs are considered "haram" (impure and contact is prohibited under Islam), it is nice to come across an open market where one can give a dog a home. Personally, I find the ample presence of pet stalls a distinguishing feature of this endearing street market and worth pawing through for a visit! 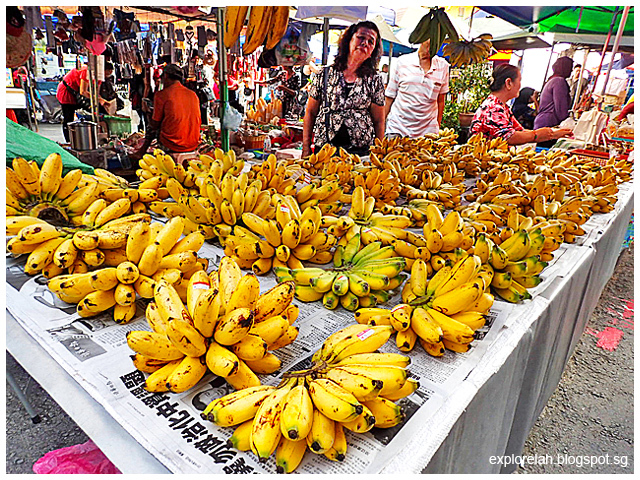 The well-known weekly market is at Kota Kinabalu's historic core so it is not difficult to get to as most tourist establishments huddle that area. 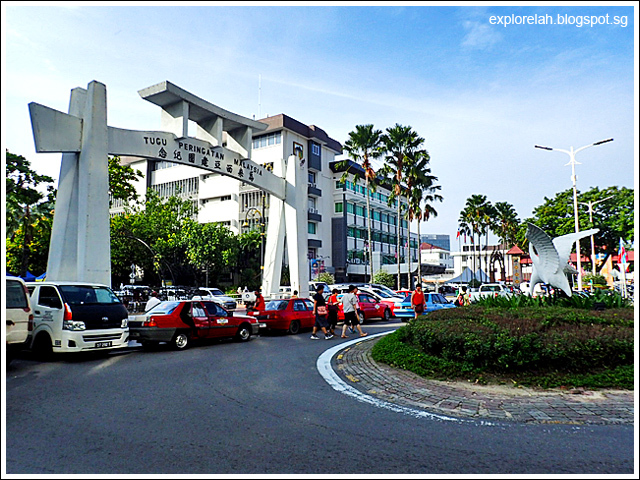 From what I saw, there are quite a number of hotels close by and not too far from Jesselton Point Ferry Terminal. There are several access points to Gaya Street Sunday Market but this roundabout with a pair of cranes seem to be the favourite entrance to get it. 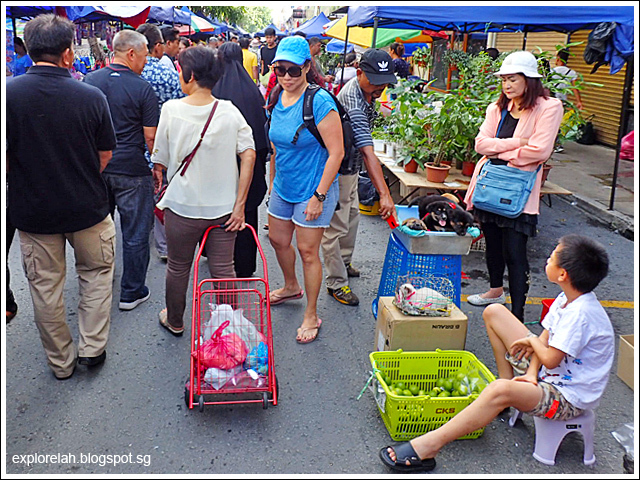 Although it is easy to get to Gaya Street Sunday Market by cab, I would recommend walking here if that is possible. The reason being that heavy traffic chokes the main access road to the market, so it could take a longer time to get there in a car than if one had walked. We were stuck in our minivan for quite a while before being released from the jam to begin our exploration of this local weekend spectacle! 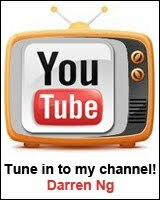 Hold on to Your Eyeballs, There's a Lot to See! How much you enjoy a place really depends on the breadth of your interest. On the surface, Gaya Street Sunday Market comes across as any other local Malaysian pasar malam (night market) brimming with identical stalls hawking knick-knacks, produce and snacks but look closer and something unique quickly comes into focus. 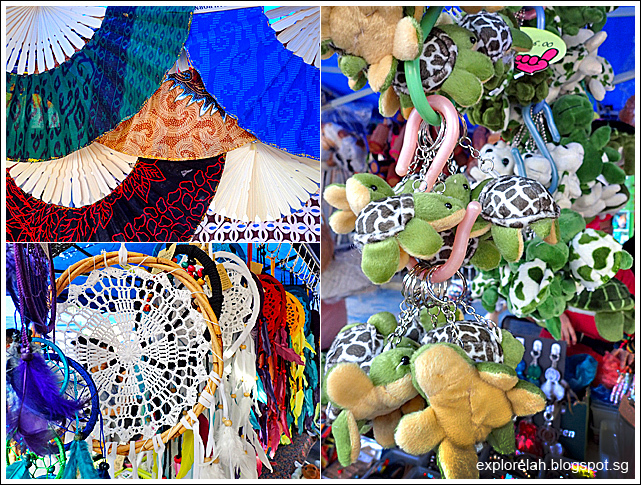 For some reason, dreamcatchers, which are of North American origin, are a thing here. Perhaps the Sabahans are dreamers. 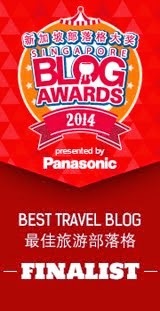 A lively mix of locals and foreigners filled the corridors created by pointy blue tents. My heart turned to ice-cream on a hot day looking at this one. If only I could bring you home! My heart turned to wax of a burning candle. 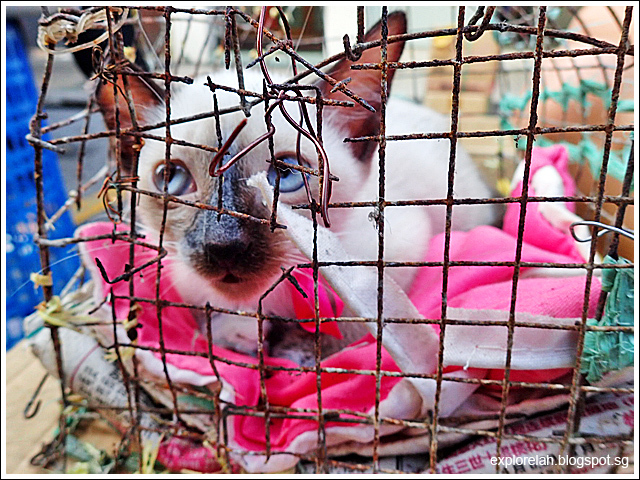 It's crying inside for this helpless kitty inside a rusty cage that's rather small for it. If only I could bring you home too. The makeshift "stall" where the puppies and caged cat were being sold. 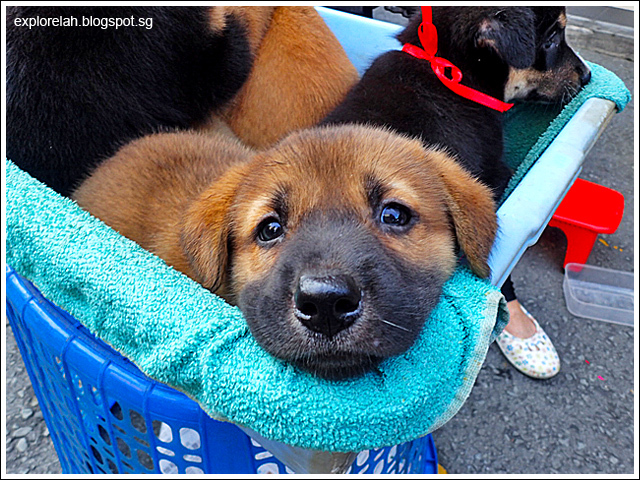 Further down the street, a bigger pet seller displays a litter of sleepy puppies. Everyone wants to pet and get a picture of the cute furballs. I wonder if they have been drugged or just sleepy from the morning heat. Now, that's how the upward-facing dog yoga pose should look like. LOL. 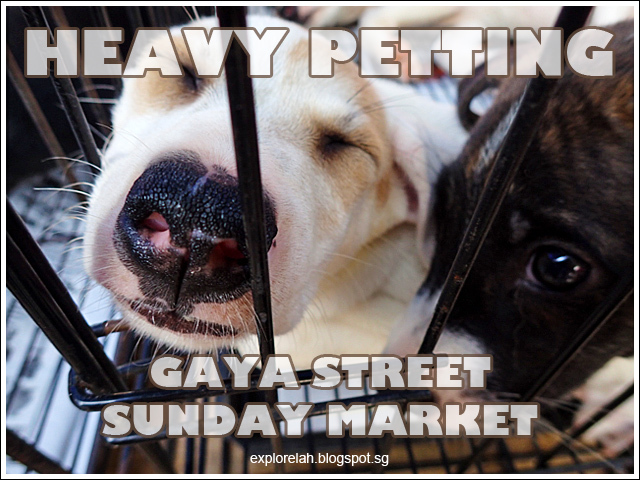 Gaya Street Sunday Market is a bad place for me to come to. 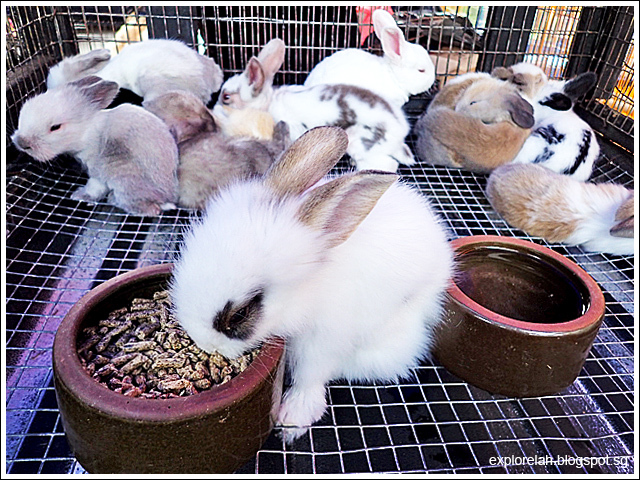 I just want to bring all of them home! 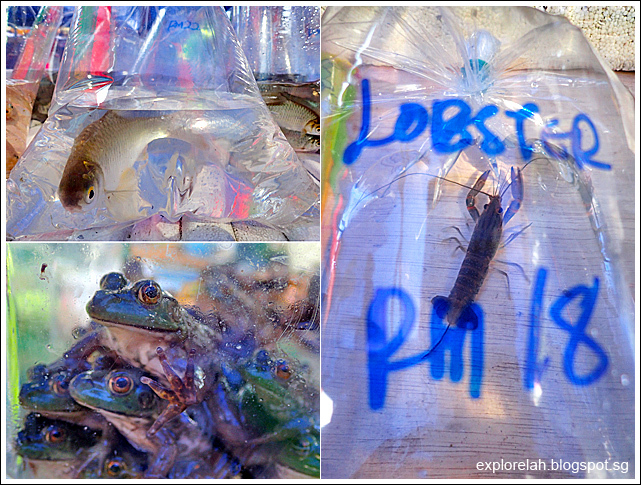 Took quite some determination to pluck myself away from the furry ones and scale up on the aquatic pets on sale. Such a variety of watery species! Whenever I see frogs in tanks, the next I see them is in a claypot. With ginger and spring onions. But these big-eyed beauties made me appreciate what amazing creations they are. Not just as food. Same with the lobster. 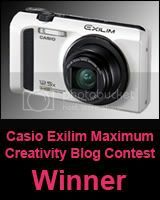 The legs are so thin and disproportionate to the body! Scenes at the market. The coconut monkey heads look unnerving and creepy though. 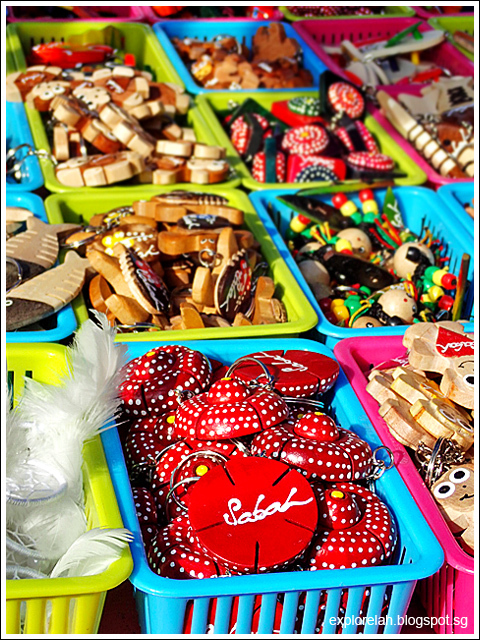 The thing that says "Sabah" is the iconic Rafflesia Flower (a.k.a. corpse lily and the largest single flower in the world) that calls this region home. 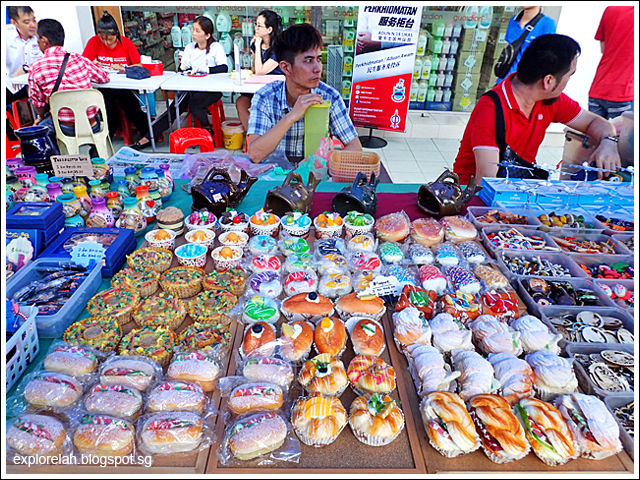 Came across this stall with a delectable spread of confectioneries. Except that they are all fakes! 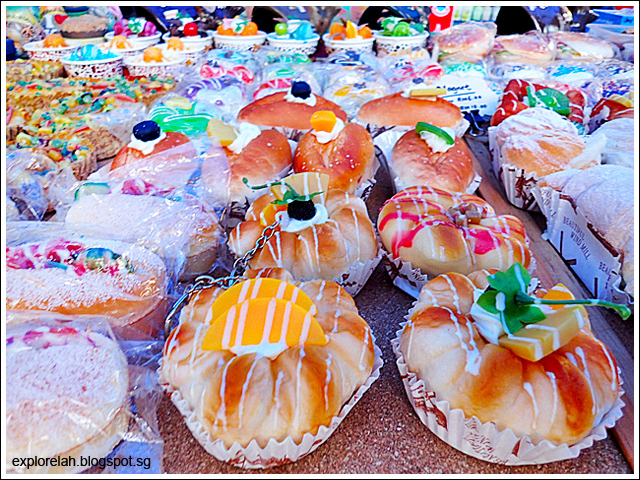 Such details went into making the fake food that they look better than the real thing! Glad to eat them all up with my eyes and don't have to worry about waistline. 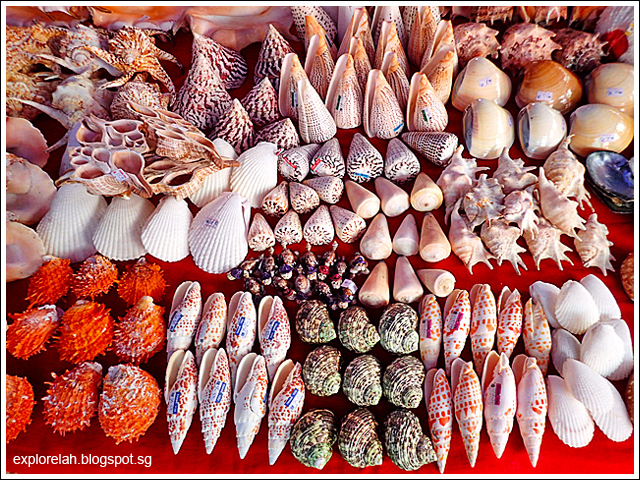 Large collection of exotic seashells on sale although I'm pretty sure they cannot be brought out of the country. 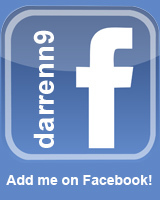 Buy at your own risk of flouting local prohibitions. 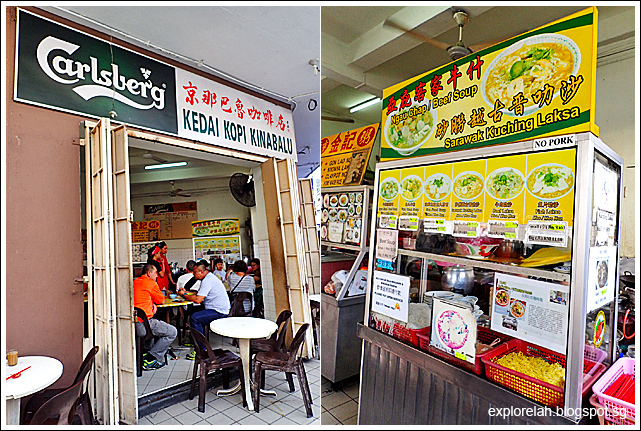 Read online that this eatery serves the best laksa in Kota Kinabalu but we were short on time and stomach space so didn't get to try. 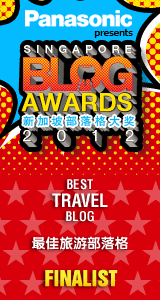 Perhaps next trip. 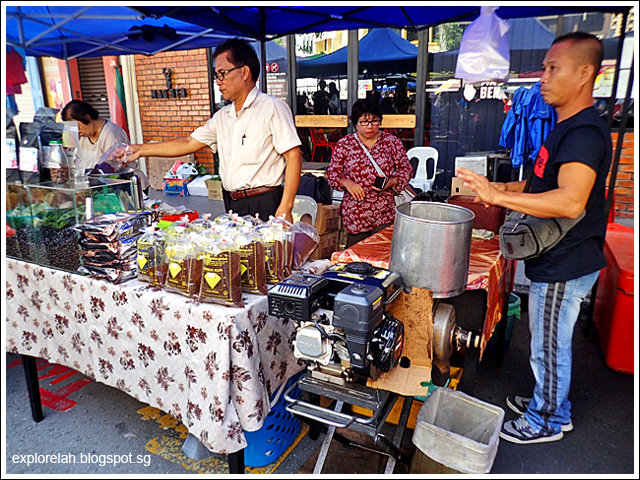 A chat with the local stallholders though, I was recommended to try the laksa at Kedai Kopi Kinabalu instead as this is the one locals prefer. 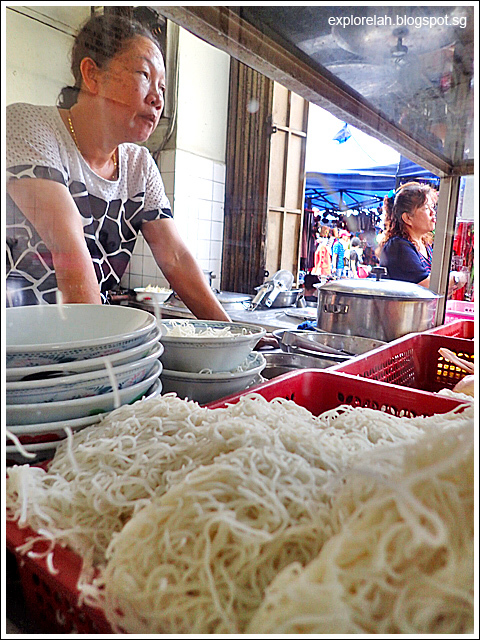 The coffeeshop where the laksa stall is is just off a side street of the market. Time was limited so I didn't try the laksa here. 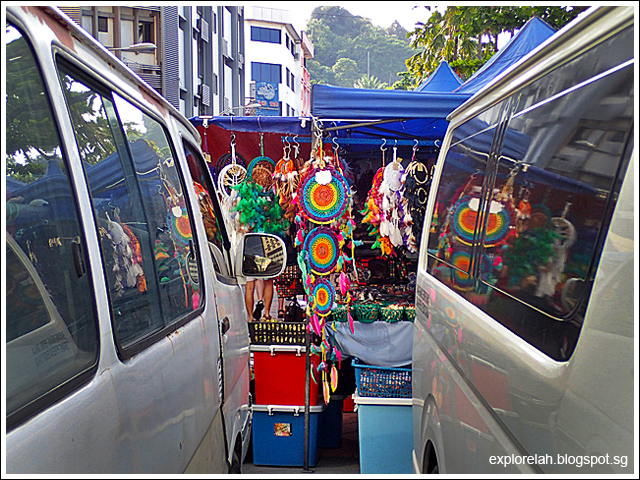 Hopefully when I get to visit Kota Kinabalu again, I can find out for myself why this stall hold the locals spellbound. Looks like antelope horns but they are actually a local snack wrapped in some kind of leaf. Again, my tastebuds had to wait for a future trip to sample its flavour. 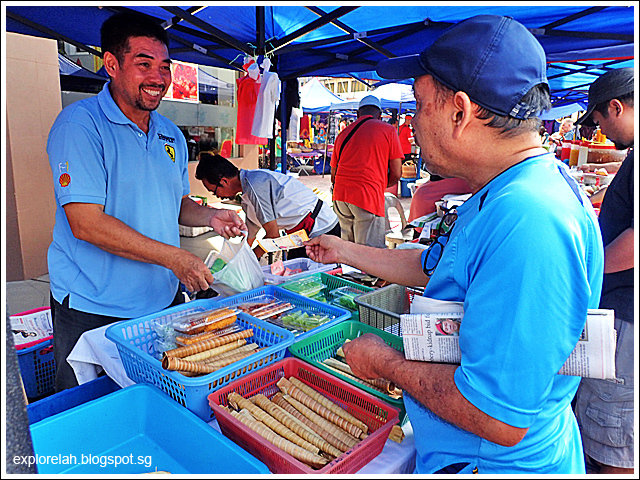 Keropok (fried crackers and tidbits) galore! Freshly ground Sabah high mountain coffee. The roast was very aromatic. 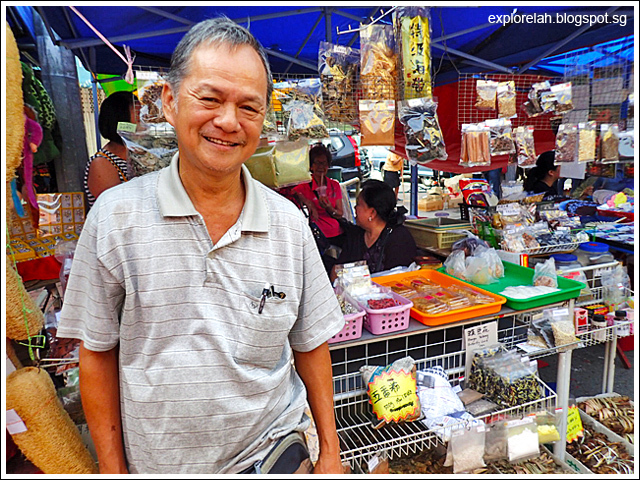 Very friendly uncle selling natural herbs that are used in traditional remedies. 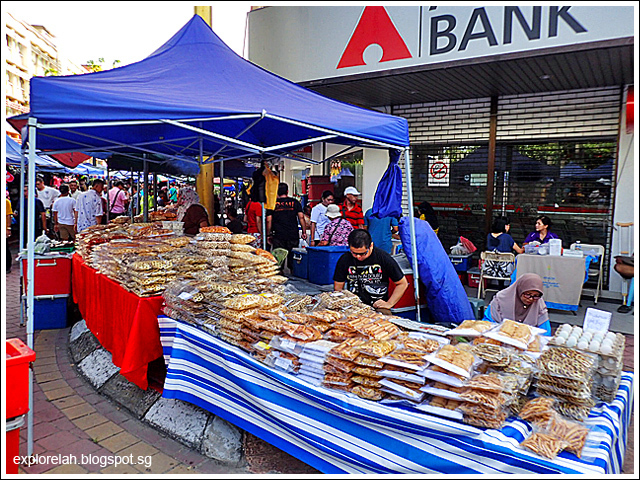 Best thing to buy in Kota Kinabalu, if you ask me, is Tongkat Ali. Its bark shavings can be steeped in hot water and drnak as a tea. 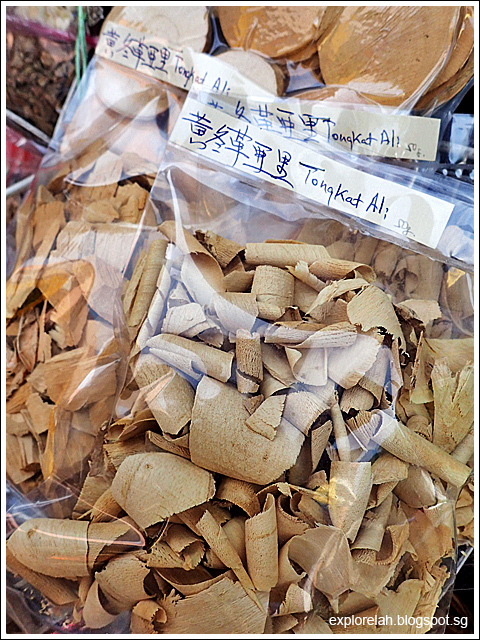 Tongkat Ali is reportedly the Southeast Asian equivalent of Viagra as it is purported to have aphrodisiac effects for men. I was also told that Malay bodybuilders take Tongkat Ali supplement to enhance muscle development because the plant is supposedly good for that. Out of curiosity, I bought a pack. The tea made from Tongkat Ali is very, very bitter. And I'm someone who can eat bitter gourd raw! 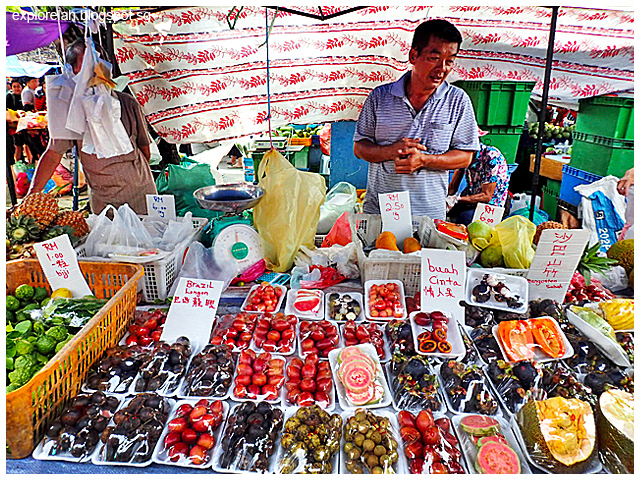 The other must-buy in East Malaysia is the pepper. 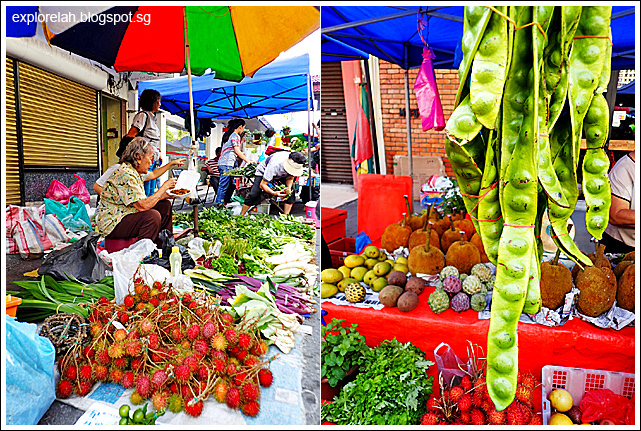 Sarawak, a neighbouring state of Sabah, is well-known for its fragrant and spicy peppercorns. Most commercial pepper powders would apparently contain other cheaper powders as fillers, so I was told by the stall owner, but pepper powder bought here is 100% real stuff. Dunno how true, but I bought since I'm a fan of pepper. 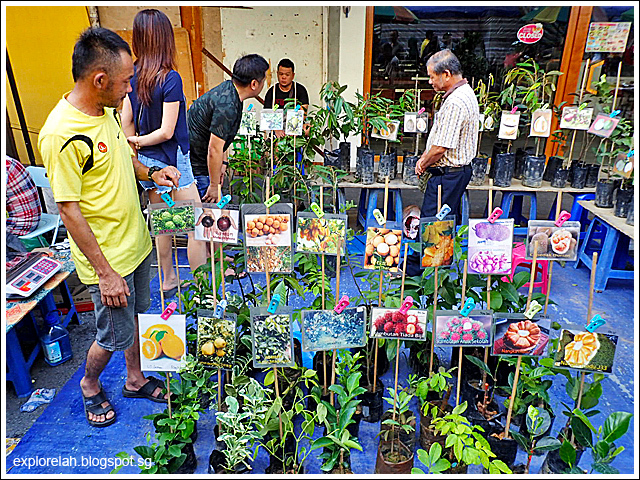 Fruit tree saplings are also quite a thing here. Being an urbanite, this was a rare chance for me to get acquainted with how the plants of my favourite fruits look like. 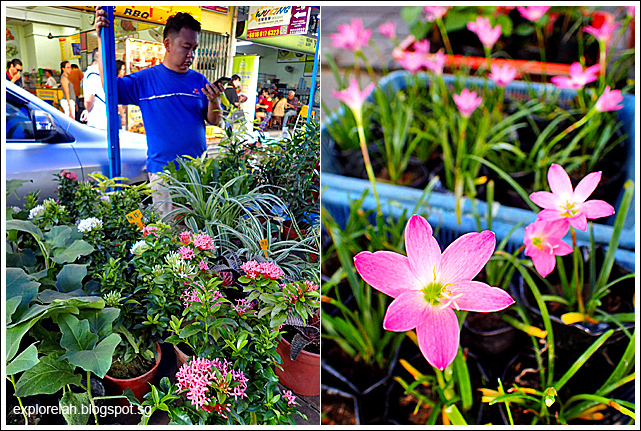 Nature is a commodity at Gaya Street Sunday Market. 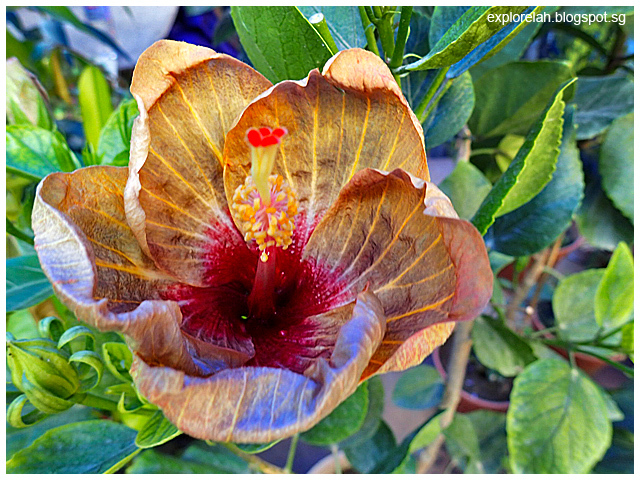 Huge hibiscus the size of dinner plates when they are in full bloom. Farm fresh no less! 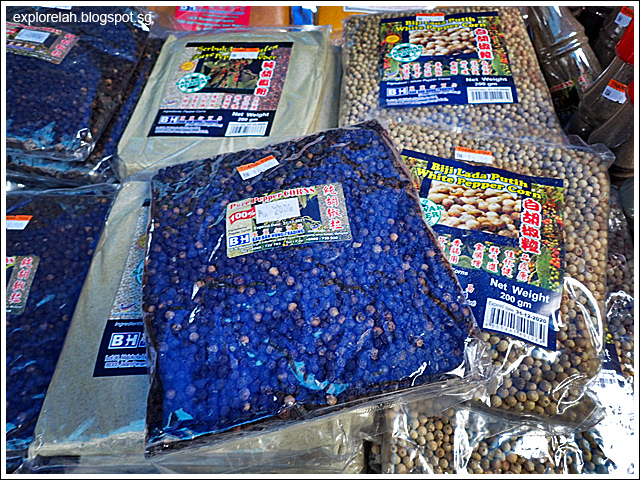 I was contemplating if I wanted to bring home my super loved petai bean pods. I can't explain it but I adore the flavour of this stink beans. Apparently, the chemical constituents that give it its distinct taste are cleansers for the kidneys. I've not seen this fruit that I thought resembles a spherical toilet brush! Such a weird appearance. Somewhat like bristle coral on land. 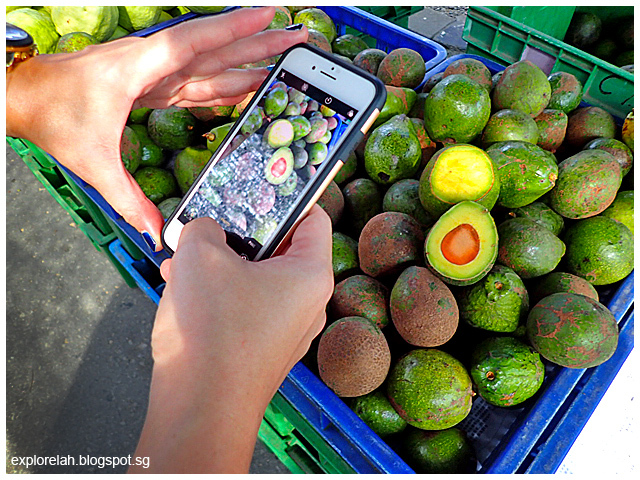 So this is the Tarap fruit and native to Borneo, which Kota Kinabalu (Sabah) is a part of. I didn't get to sample it but the internet tells me that it smells like durian but tastes like jackfruit. Two of my favourite fruits in one! Must try next time I visit again. 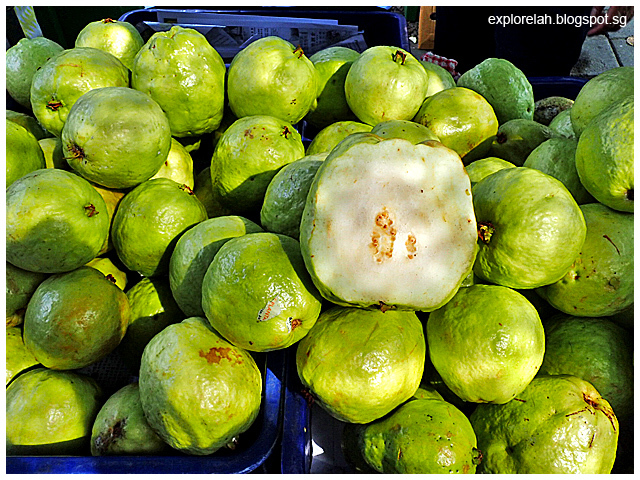 The guavas here look like they go to the gym. Huge and meaty! The avocados too. 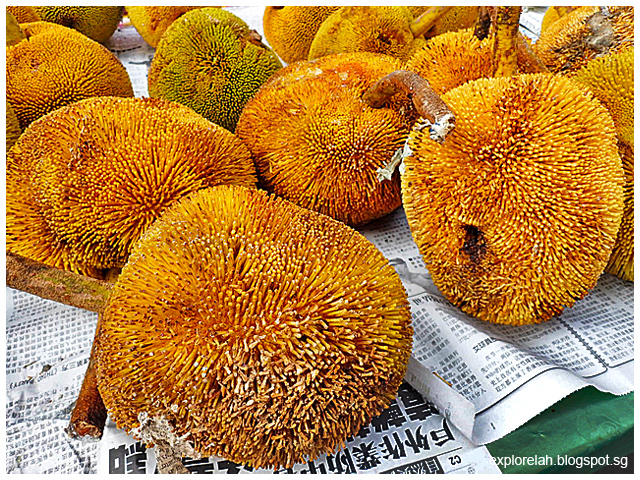 They were larger than what I'm used to back in Singapore and had question marks what fruit this is until I took a closer look. 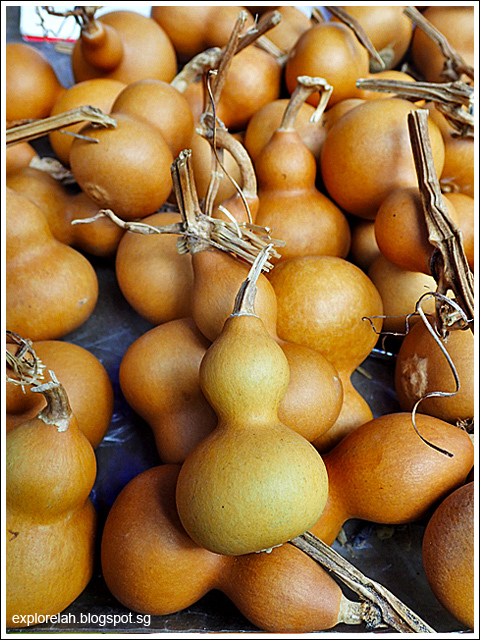 Baby gods, I mean gourds. If I am a fruit bat, this is my heaven! 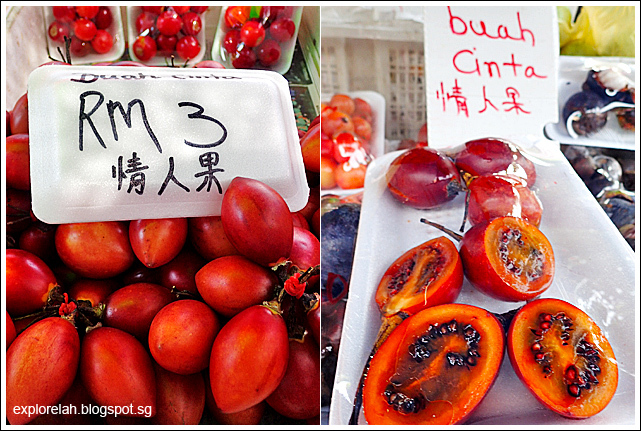 The name of these crimson fruits reflects my hope of finding one. Heh heh...But they taste rather sour. One of the aspects of love perhaps. Hopefully eat liao can find a lifetime partner! 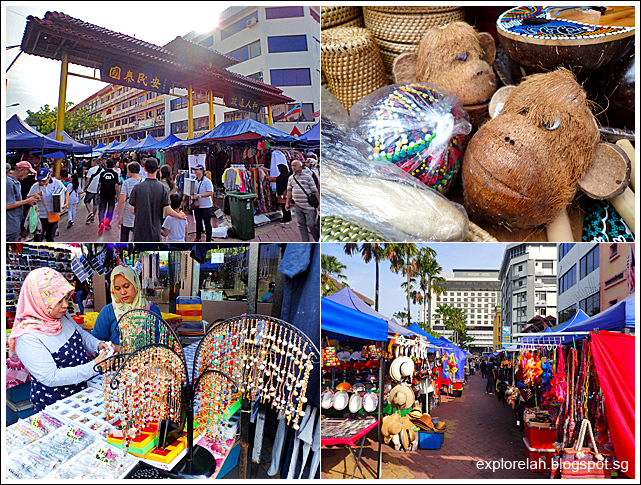 I had only about an hour to explore Gaya Street Sunday Market before heading off to the off-shore islets of Kota Kinabalu. 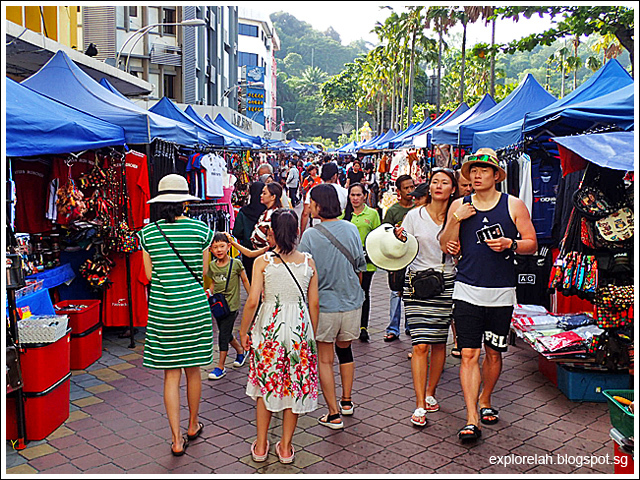 Before coming here, I thought one hour was excessive as I expected it to be similar to other street markets I've visited so far in Malaysia. But I was wrong and pleasantly surprised by what I encountered here. 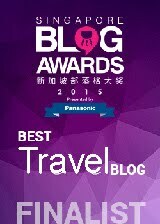 My heart smiled because of the genuine friendliness of the locals and my eyes widened at the incredulity of nature! 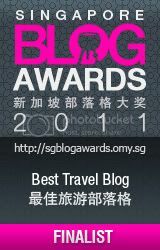 ... in Kota Kinabalu's tourism scene. 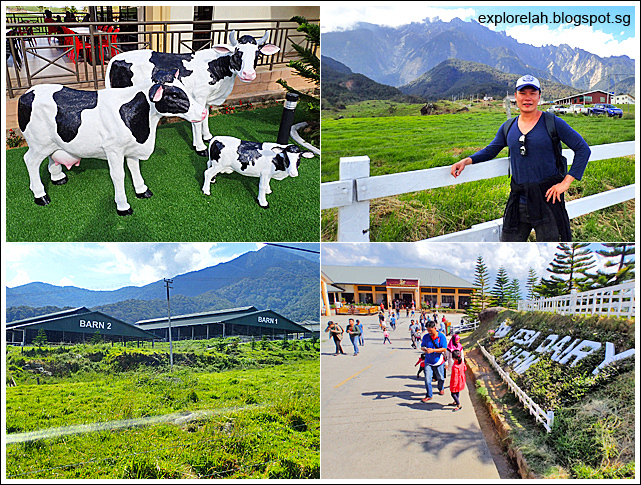 Resembling a page out of a New Zealand travel brochure - waves of mountains, verdant fields and idyllic countryside charms, it is no wonder that visitors are herding to Desa Dairy Farm for some scenic grazing. 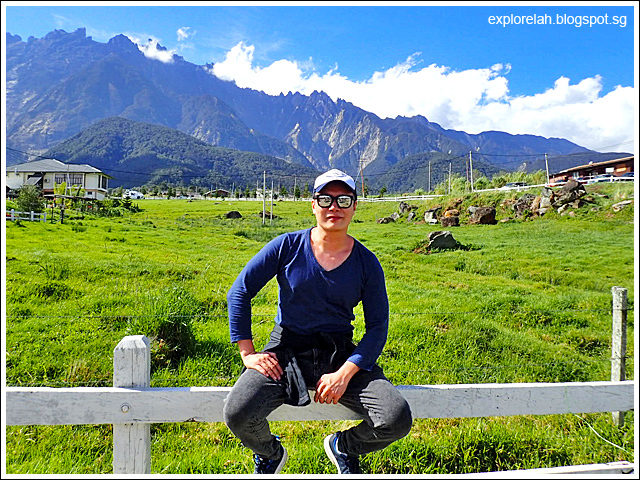 Plus, of course, the lower highland temperature of around 20°C makes it a cool escape from Sabah's sauna climate. 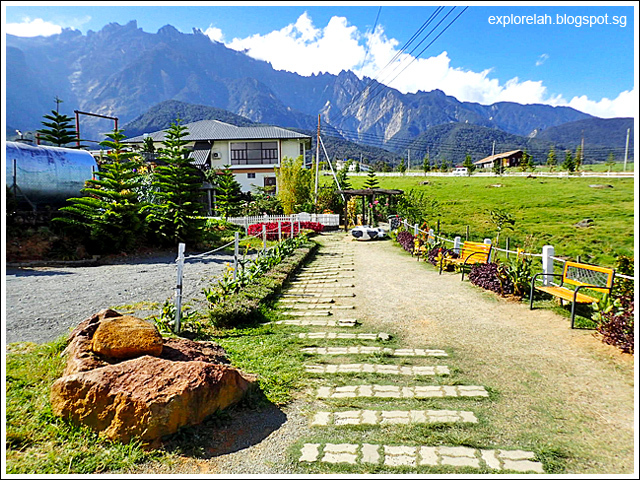 The village of Mesilau, where Desa Dairy Farm calls home, is nestled on a high plain with the stately Mount Kinabalu for a backdrop. Getting here by public transport is a mystery as it seems non-existent; so the best way is to join a packaged day tour, hire a private transport with driver, or self drive. 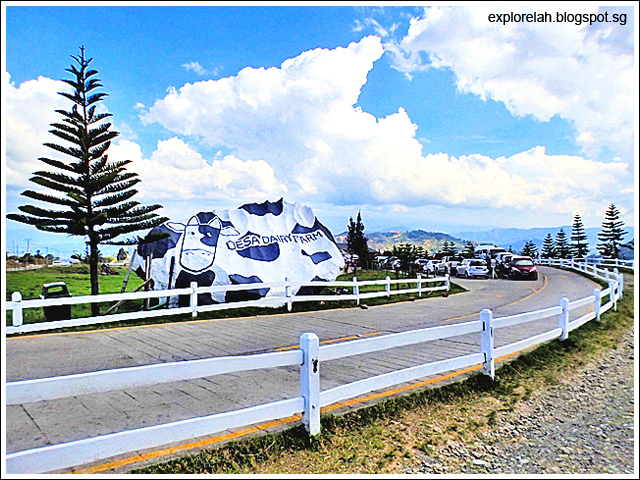 It takes about 2.5 hours to get here from Kota Kinabalu City and under 30 minutes drive from Kinabalu Park. Entrance driveway to Desa Dairy Farm. An entry fee applies (Adult - RM5, Child - RM4) and our minivan queued for about 20 minutes before it was our turn to pay and enter. I wouldn't have thought this is Malaysia! 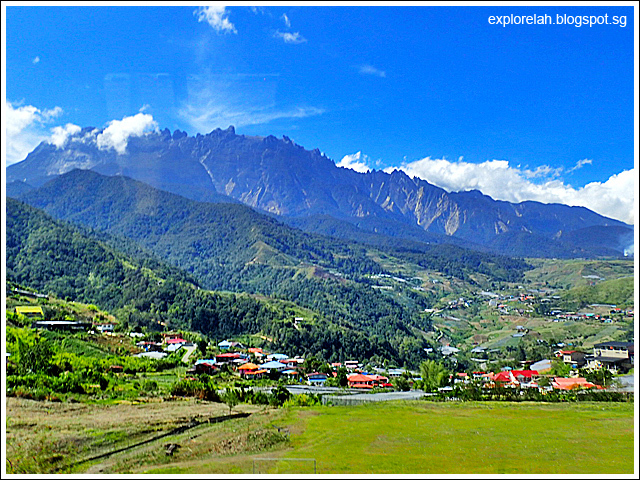 Another setting to shoot Mount Kinabalu. 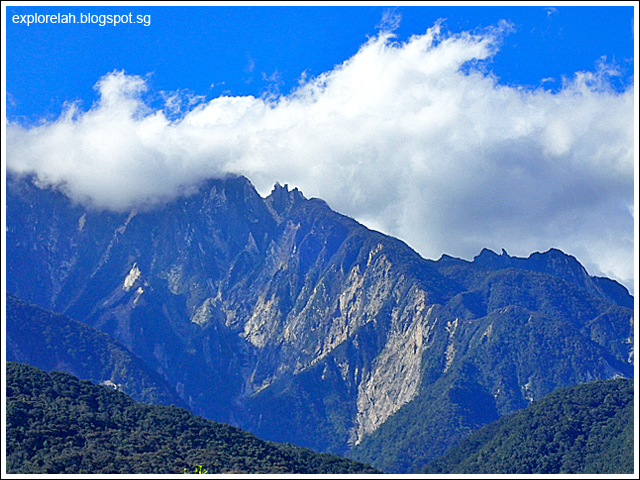 Clouds caressing the mountain peak ever so gently. Purple fireworks. 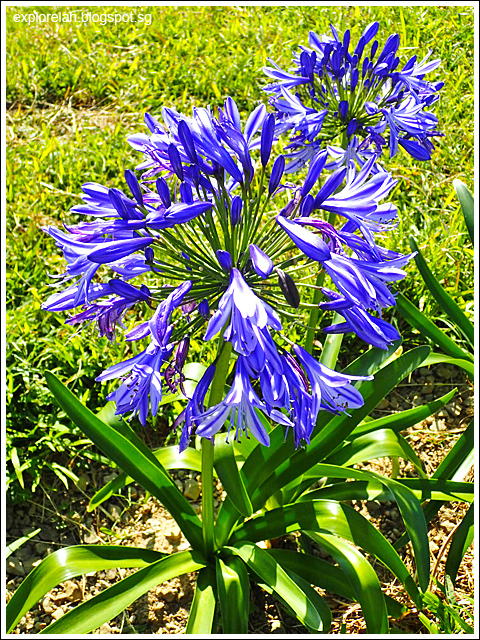 Quite some interesting flowering plants can be spotted around Desa Dairy Farm. 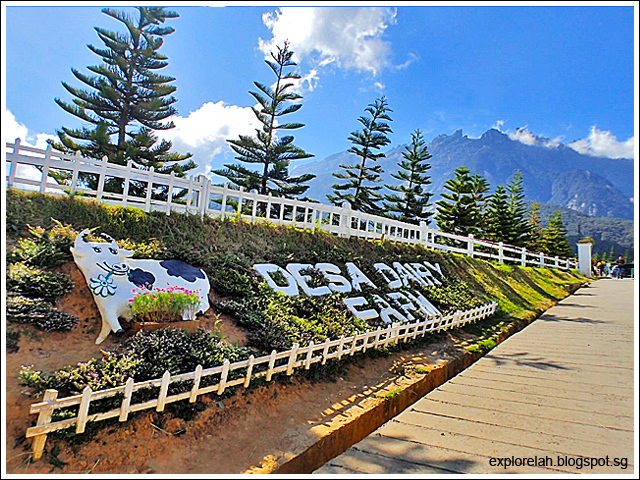 Desa Dairy Farm is nicknamed Kota Kinabalu's Little New Zealand. 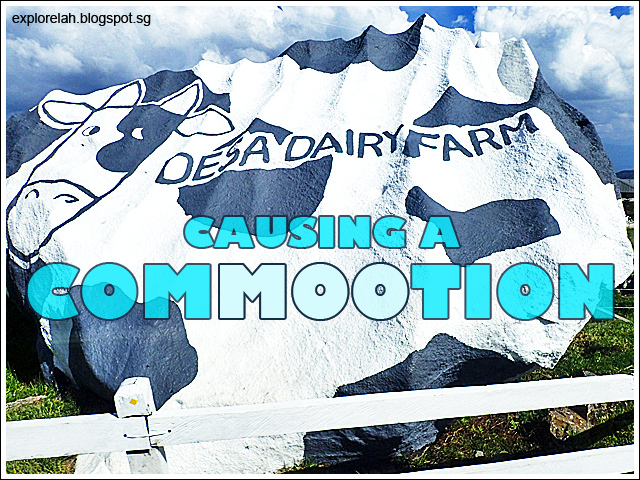 Desa is actually a local household brand name with generations of Sabahans growing up with milk from this farm. 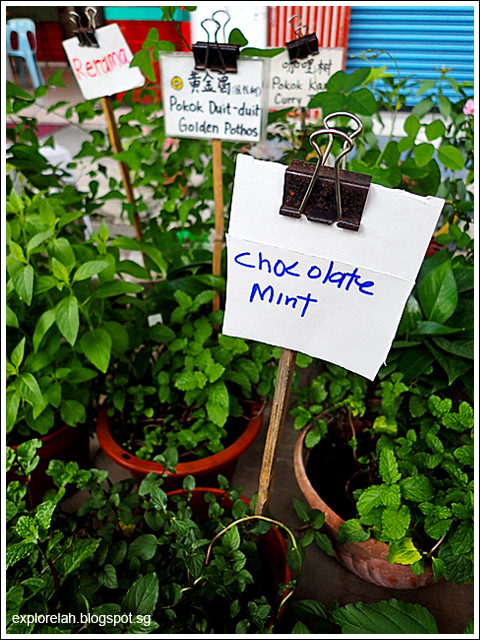 The farm serves only the domestic market and does not produce enough to export. 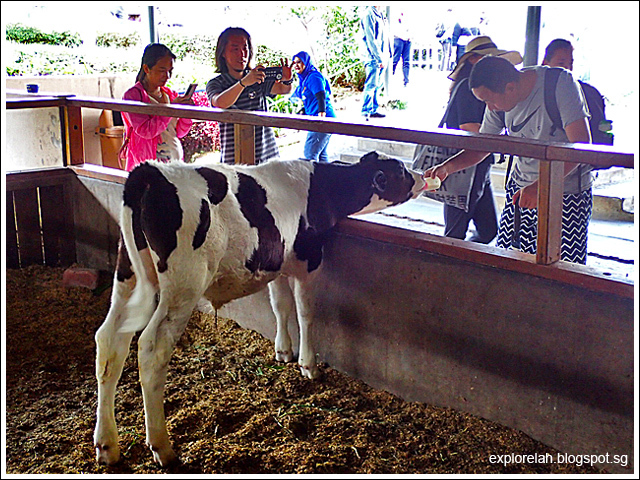 Step on in to enjoy fresh milk, ice-cream, yogurt, cheese, cakes and also watch the milking process. 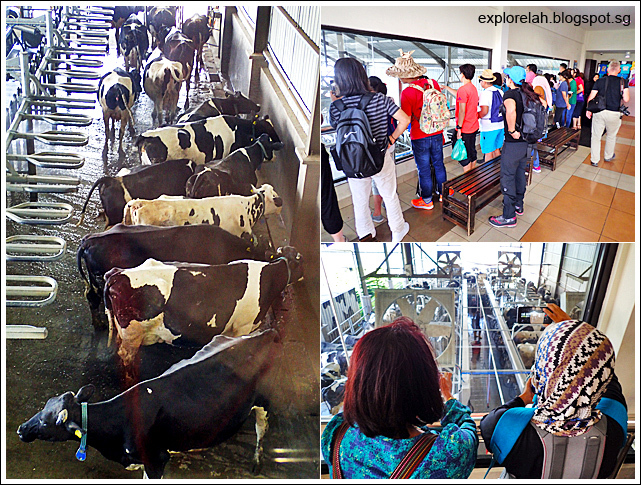 Viewing gallery to watch the milking process which happens from 2:30 - 4:30pm daily. 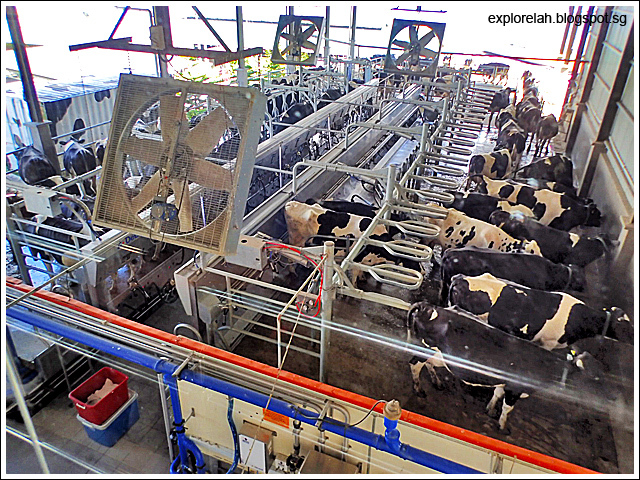 The farm produces about 900,000 litres of milk every year. 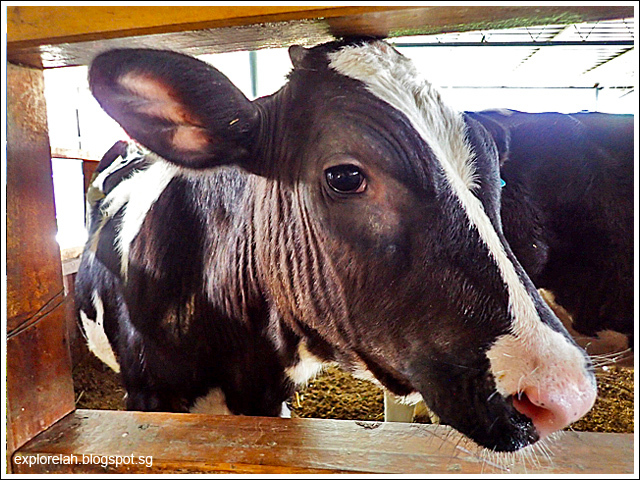 Cows at the farm are of the Holstein-Friesian breed, which produces one of the highest milk outputs and also interesting to look at because of the black-and-white patterns. Milk straight from the farm... can't get any fresher than this. 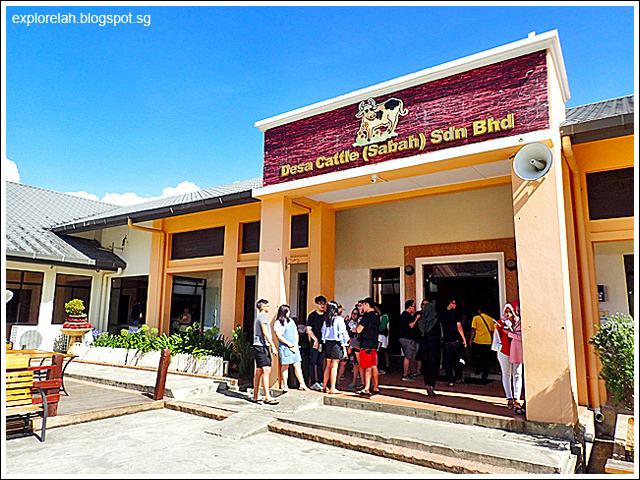 Too bad I'm lactose intolerant so I refrained from tasting anything at the farm in case I leave a brown all the way back to Kota Kinabalu City. After viewing the milking process and tasting the dairy products (have to pay hor, not free), walk around to the back of the milking facility to a small shed to feed some calves and baby goats. They are perpetually hungry! 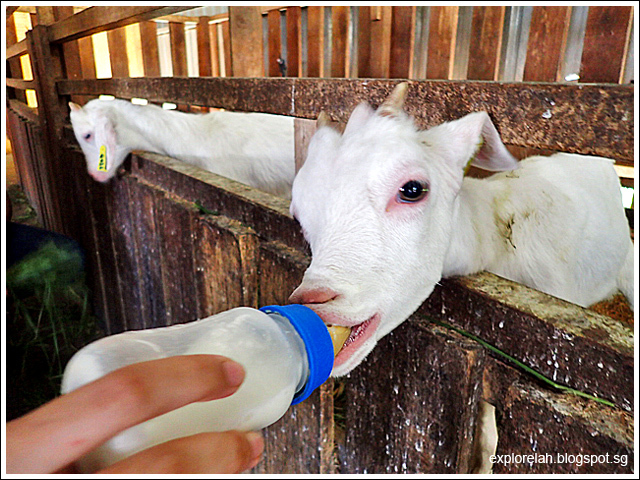 Feeding milk to get milk... a bottle costs RM1 to feed the animals. Same price goes for a bundle of grass feed. Have to put up with some smell from the livestock. This fella is rather friendly and endearing. Makes me feel bad for liking beef. First you feed. Then you bleat. Hope not bleed. 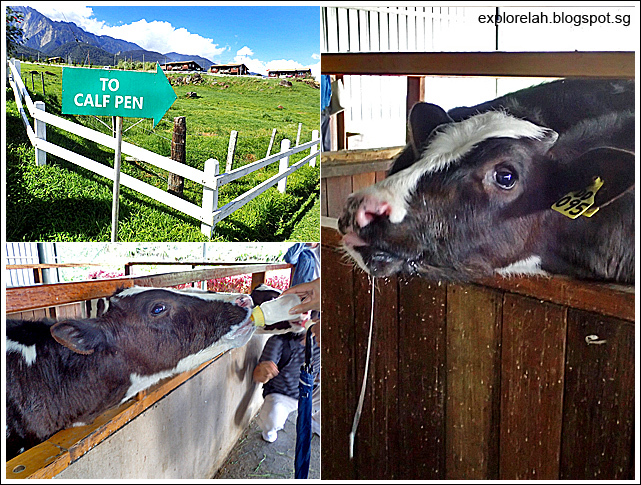 The visit to Desa Dairy Farm was quite an eye opener to discover such a picturesque highland farm setting in Malaysia. 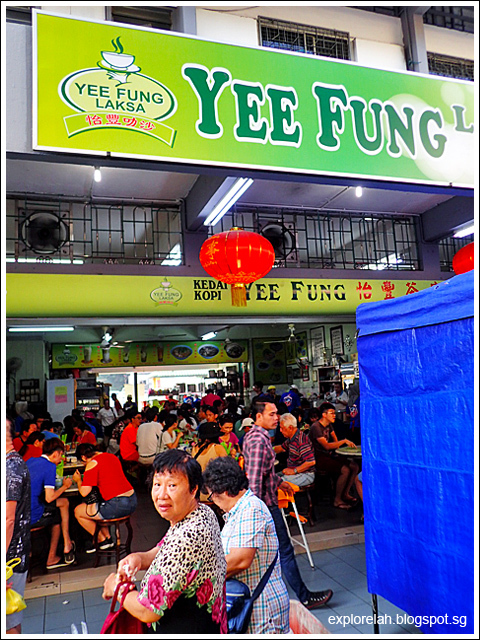 But because of my lactose intolerance and restraint in sampling the fresh produce, and the large visiting crowd, the place became a yawn for me after about 15 minutes. 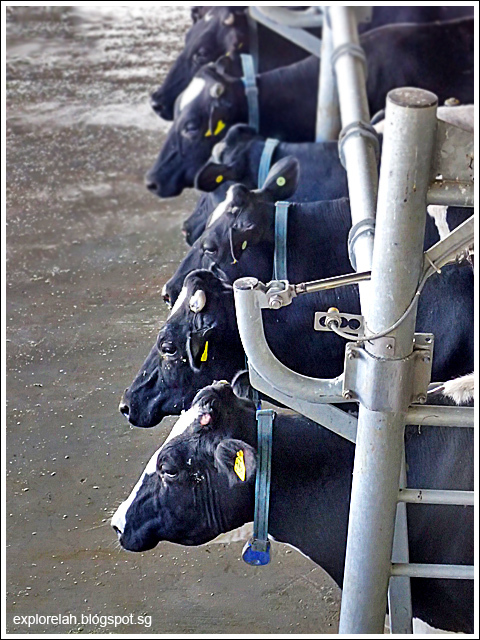 If you can control passing mootion after dairying up, you'll have a more fulfilling here.